I bought my ’95 RT as a bike for my wife and I to ride together. On our first ride, it was painfully clear that the stock fork springs did not provide adequate support for the front end. Every time the front brakes were applied, the front end took a drastic dive. So much so, that I only used the rear brake for the rest of the ride. I talked to Ted Porter about upgrading the suspension on this RT and he recommended the Wilber Progressive Fork Springs. The progressive design allows for a softer initial engagement, but stiffens up as the fork travels down under load. 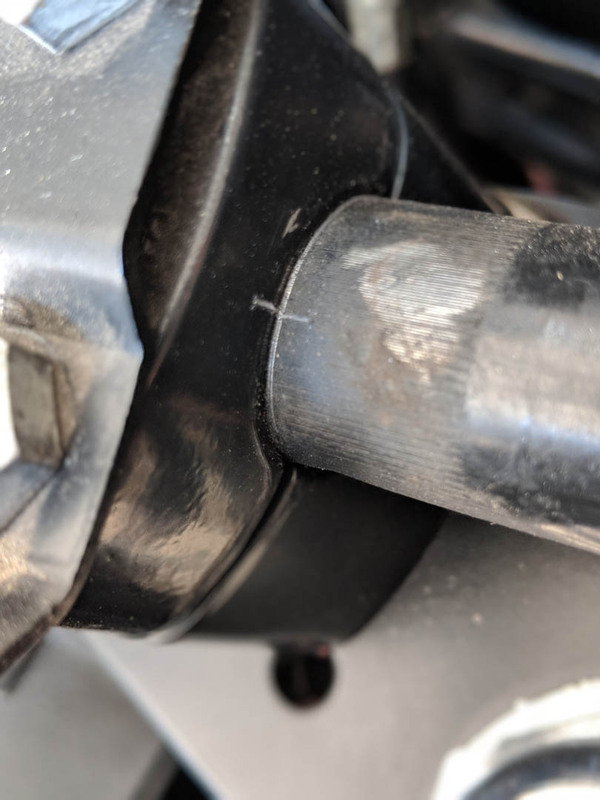 When I had removed the fork sliders shortly after buying the bike, I noticed that the fillister-head screws were in bad shape. 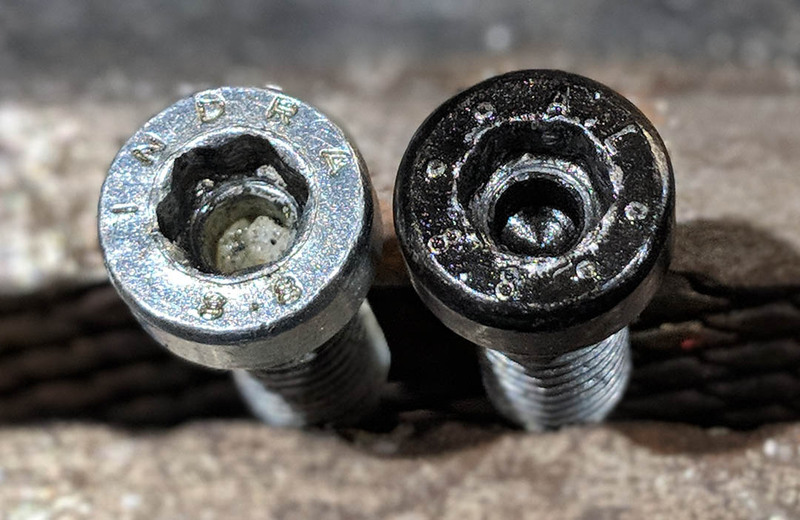 Each screw had three washers on it and they were extremely crushed and deformed as they had mushroomed up around the screw head. I decided to replace these screws and washers at this time as well. I put the bike on the center stand and strapped the rear wheel down to the lift deck. With the front wheel off the ground, I blocked up the oil pan to stabilize the bike. 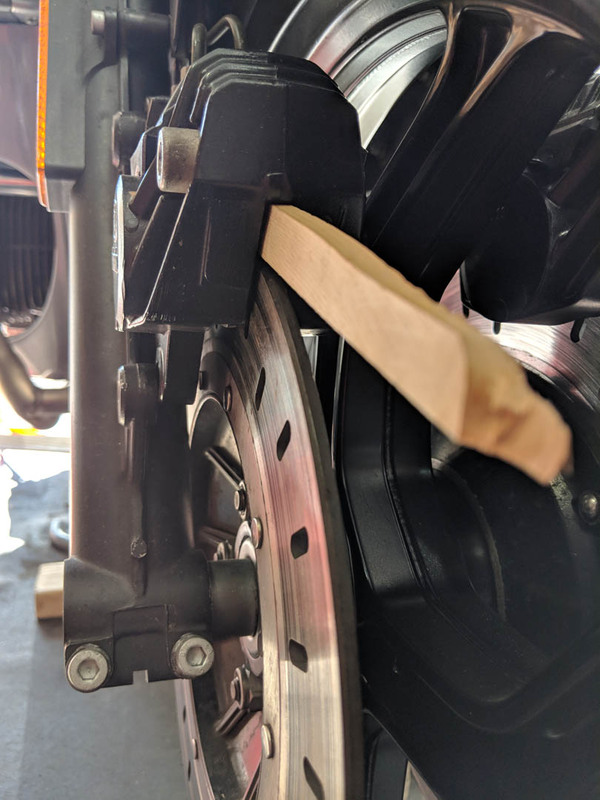 I inserted a wood shingle between the brake pads before removing the front wheel and calipers, widening the gap between the pads. With the wheel and fender removed, the calipers could be set on the ground, out of the way. 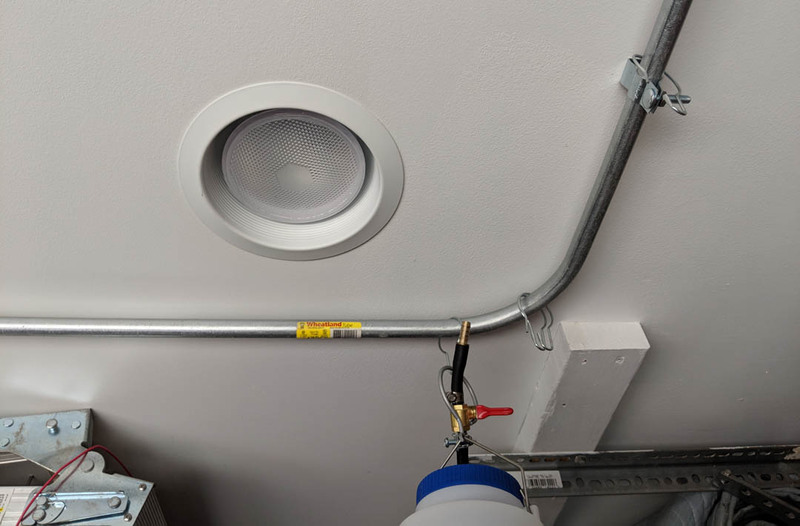 On the ceiling above my lift, I have 1/2″ conduit attached like a curtain rod for hanging curtains when spray painting. I hang wire from it to hold the handlebars up when doing projects like this. Something to hang the gas tank from as well. Before I removed the handlebars, I took an awl and marked their position so I didn’t have to go through an adjustment routine to find where I like them. 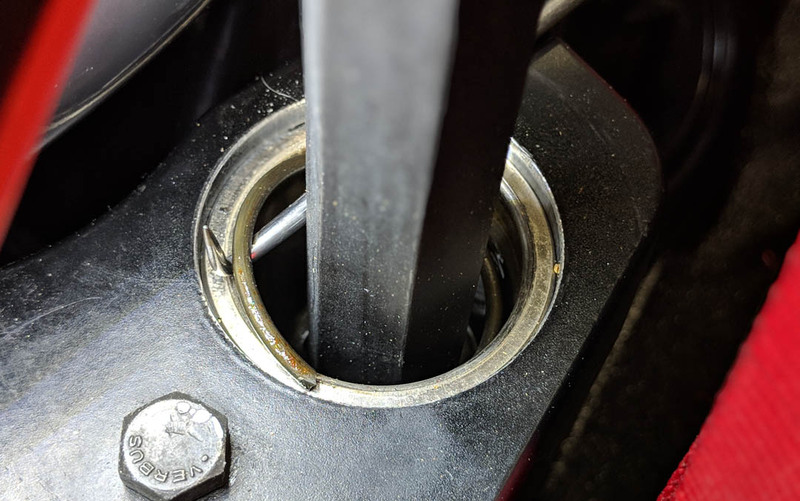 With the handlebars removed from the top fork brace and supported with wires, the plastic fork cap, hex nut and washer are removed from each fork. 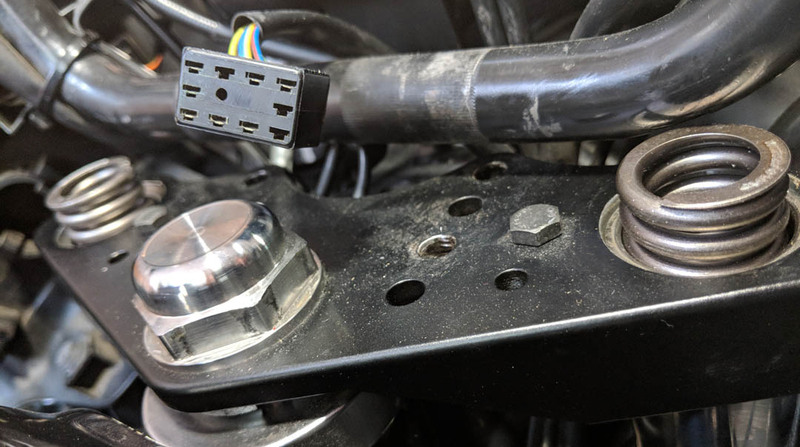 I have a 41mm socket I use for removing the hex nut. I use a small 3/8″ impact driver with the socket. I have a Toaster Tan top brace on the bike which eliminates the high torque (78 ft/lbs) required on these nuts. With this setup, the stanchion top hex nut plays NO part holding the forks, and thus is only torqued to 35 ft/lbs. The spring retainer has a 17mm allen head. It’s held inside the tube with a snap ring. To remove it, you have to push it down into the tube about 1″ and then with a pick, pry out the snap ring. You’re also doing this with the spring pressure working against you. 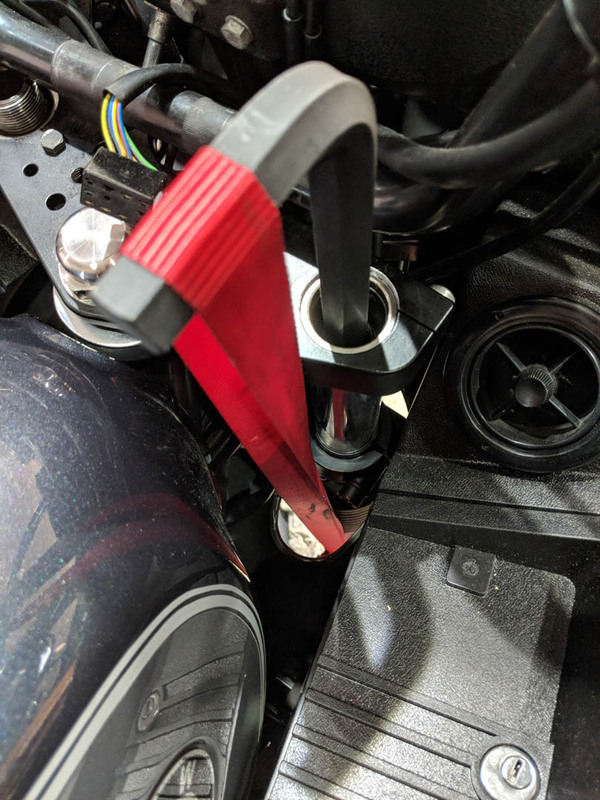 Unless you have arms like Arnold, you will need to employ some other method of holding down the spring retainer while you work at removing the snap ring. 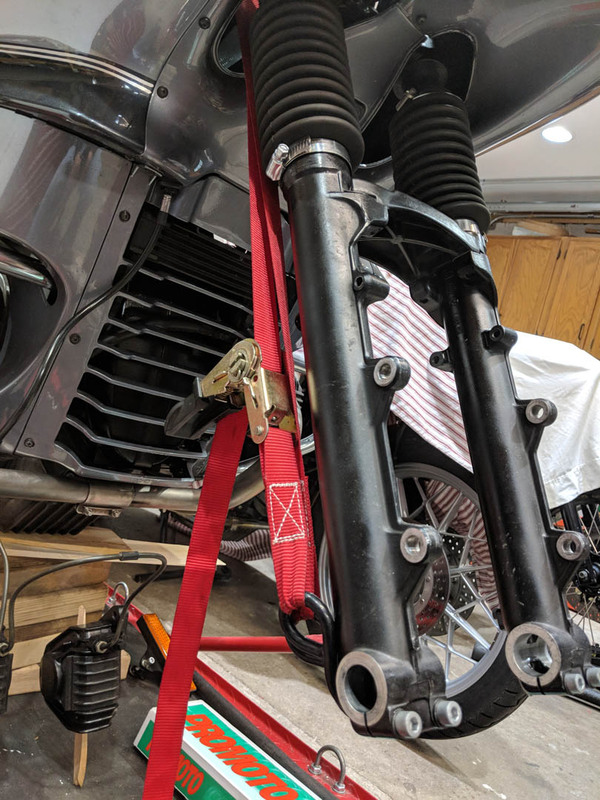 Using a cheap ratchet strap works well in my case since I took the fork bellows off the fairing and use the 11 ribbed rubber boots (31 42 1 234 908) instead. 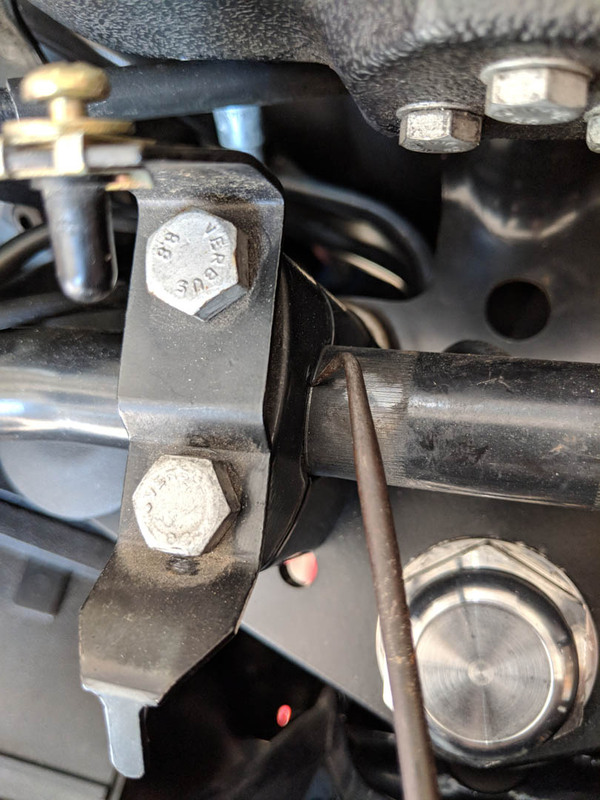 I have a 17mm allen socket, but using it puts the strap right across the fork tube where I need to work, so I used a regular 17mm allen wrench. I ran the strap down through the fairing and hooked on to the bottom of the slider. 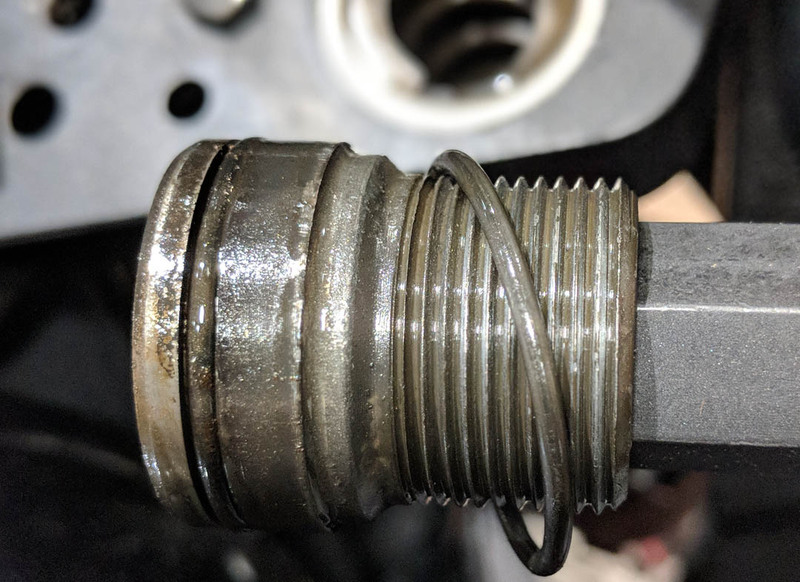 It took a little finesse, but eventually the spring retainer was held down with the strap far enough to access the snap ring. I used a 90° mini hook to catch the end of the snap ring and pry it out. The strap is carefully loosened and the retainer and ring are removed. The o-rings were in good shape. 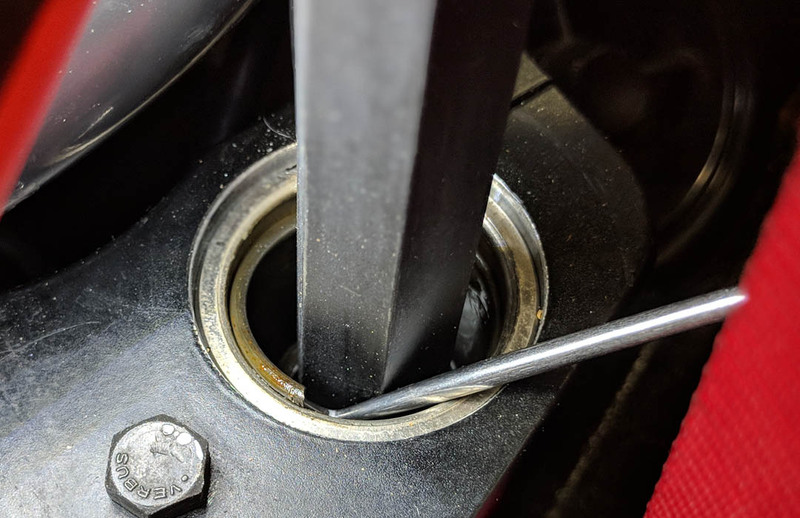 The stock springs were flush to the top of the stanchion. 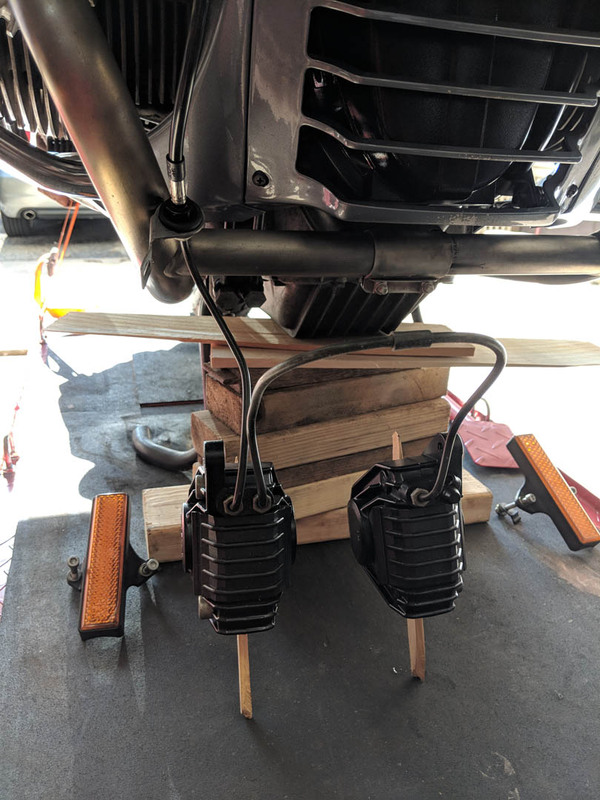 Since I had already drained the fork oil the night before, I pulled the springs out without oil dripping off them. Comparing them to the new springs, the Wilbers have more coils as well as the tight progressive coiling at one end. 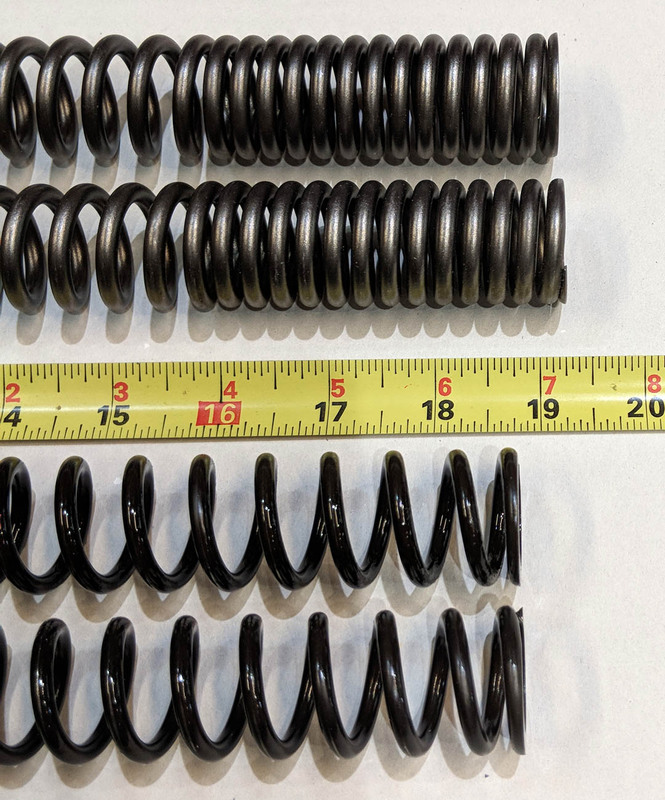 The Wilbers are 1/2″ longer than the stock springs. I filled the forks with Spectro 15W fork oil. I like a stiffer fork. Even more finesse is needed when reinstalling the spring retainer as there is more tension on it from the new springs. Once the retainer is compressed down into the tube, the snap ring can be put back in. I found it harder to install than remove. One end of it needs to be pushed down into the slot, then you can work it around with the pick. Once it’s seated, the strap is loosened and now ready to put the hex nut back on. I took it for a brief ride around the block and could tell a big difference. When I aggressively applied the front brake, the front end dropped a little and then leveled out. No more extreme dive! I’ll fine tune it over time with oil weight and preload if needed, but right out of the box, this is a great improvement.